The one and only 100% virtual conference for WordPress made an exciting comeback in 2018. This event features 11 hours of fresh material that covers a wide array of topics. There is plenty of material here for you, no matter how you would rank your current skill level. 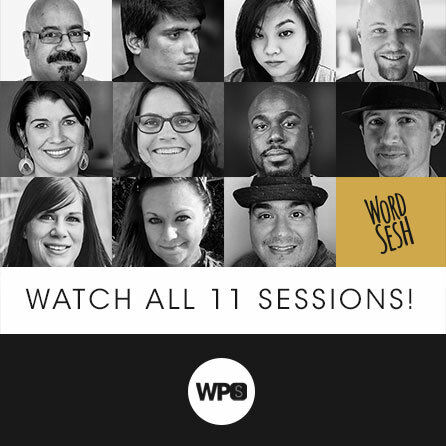 As a member of WPSessions you can access all of the replays and speaker slides right here on WPSessions at no additional cost. We covered a lot of ground in this edition of WordSesh! Whether you were looking to improve your independent contracting game, do more with eCommerce, improve your tooling and workflow, or any other number of things in-between, there are probably multiple presentations from WordSesh 2018 that will suit your fancy. If you’re on the fence about joining then you should know an individual ticket for WordSesh was $25 USD, which means you’re immediately saving roughly the cost of a monthly membership just by watching these videos alone. As an annual member you can also download all of these videos for permanent, offline viewing. Below is a quick run-down of the topics and speakers that were recorded. For the full event brouhaha you can check out WordSesh.com. In this session, Mike shares about the many little things that are sometimes forgotten and overlooked when propping up a brand new web server. Ahmad shares some of the incredible ways he’s been able to be more productive with less time than the rest of us. Watch this presentation to find ways that you can automate some of your tasks and improve tooling not only for development but the rest of your business as well. Learn about some incredible ways of design-thinking and systems. In this presentation Helen provides a number of ways in which the use of CSS has been changing to inform other programming decisions and the ways in which we interact with the things we’re building. Tune in for this special edition of Brad William’s famous lunch-time podcast. In this episode he speaks with Scott Basgaard, Matt Medeiros, and Brian Richards. Are you a maker or a mender? Do you prefer to create brand new things and see an idea come to life, or do you enjoy optimizing and improving on things that have already been started more? It’s hard to know, for sure, without deep introspection. In this presentation, Andrea will help you better define these roles for yourself and your colleagues and help you to determine which hat is the best fit. Carrie has been providing client services for many years now. In 2017, she launched The Fearless Freelancer to provide training and community support for everyone else working in this niche. In this presentation, Carrie shares 10 important lessons to help you be more successful with your own client-focused career. It’s pretty rare that a client actually knows exactly what they need. They definitely know what they want. At least, they think they do. Nathan will show you how to ask the right questions and guide your clients to the solutions that will ultimately help them the most. WordPress has a notorious reputation for being insecure, but that’s pretty disingenuous. The WordPress core security team, and WordPress by extension, have done many things that help keep your site secure. Aaron will walk you through just a snapshot of those in this presentation as well as help you to complement the security strategy rather than counter it. How happy are you with your current web development and deployment workflow? Tessa has quite a few tips to share with you that should help you improve and streamline how you work, no matter what you’re already doing. Maura has a lot to say about web performance. In fact, she’s given presentations on this topic before! In this session she is going to share a few different strategies with you to help you better measure and optimize the sites you control for noticeable boosts in speed and performance. Join us and learn how you can optimize ALL THE THINGS! You might not know it yet, but Chris has a lot of great insight when it comes to ecommerce sites. He has been building them since before “ecommerce” was a defined term, just to give you some perspective. In his presentation, Chris has 45 different tips that you can implement to help you increase conversions on virtually any ecommerce store. And even if you don’t run an ecommerce store, you’ll find that a number of these tips can be useful to you for converting clients on your business site.